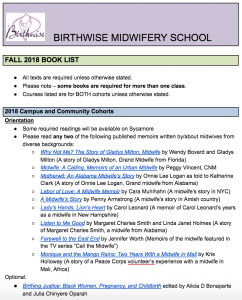 Midwifery students, take a look at the Birthwise Midwifery School: Fall 2018 Book List for information about required and recommended reading for your cohort. The book list includes links to Amazon and information about how to order these textbooks from our local bookstore, Bridgton Books. You can also find many of these textbooks in the Birthwise Library.